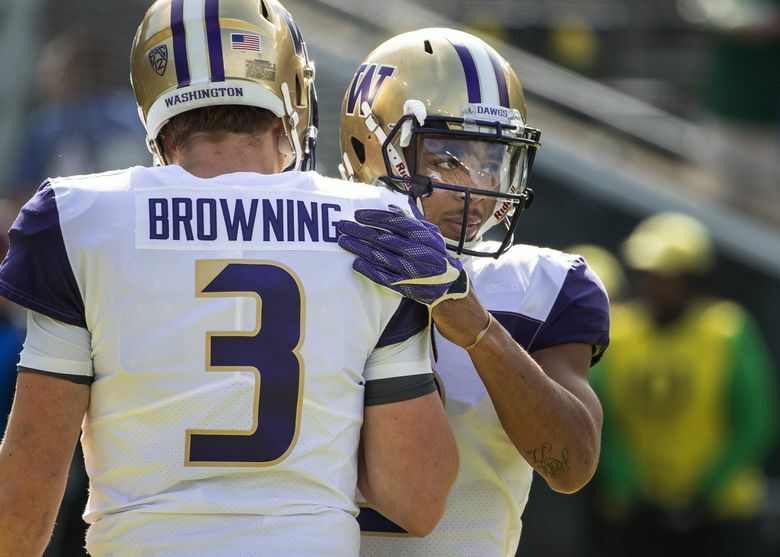 The Huskies top two running backs both exited at different times of their overtime loss to the Ducks. Gaskin returned briefly in the second half, while Ahmed didn't get another carry. EUGENE, Ore. — Washington’s top two running backs sustained injuries in Saturday’s 30-27 overtime loss against Oregon. Senior Myles Gaskin appeared to aggravate a shoulder injury in the second quarter and sophomore Salvon Ahmed injured his knee on a noncontact play in the third quarter. Gaskin had his shoulder pads removed as he left the Huskies’ sideline, escorted by two team trainers, and headed toward a training facility early in the second quarter. Washington’s all-time rushing leader had 11 carries for 54 yards before the injury. He returned to the sideline with his shoulder pads back on in the final minute of the first half, and he did get four carries in the second half — though it was clear he was limited. Ahmed had two first-half touchdown runs, the first on a nifty end-around for a 25-yard score. That gave the Huskies an early 10-3 lead. Later, Ahmed appeared to hyperextend his knee. He was down on the field for a minute, but did return to the field at the end of the game. He was clearly limited, and he did not get any touches during his two snaps in overtime. UW coach Chris Petersen generally does not talk about injuries and didn’t offer any detailed update on the two running backs. “They’re banged up. That’s football here in Game 7,” he said. The injuries gave sophomores Sean McGrew and Kamari Pleasant key opportunities late in the game. McGrew finished with eight carries for 30 yards, plus two catches for 34 yards; Pleasant had four carries for 30 yards, plus one catch for 7 yards. Starting senior cornerback Jordan Miller also left the field with an undisclosed leg injury in the second quarter and he did not return. There was no immediate update on his status. In his place, sophomore Keith Taylor took over at right cornerback. UW senior defensive lineman Jaylen Johnson was ejected in the fourth quarter after he was penalized for a targeting hit on Oregon QB Justin Herbert. Because the ejection happened in the second half, Johnson will be suspended for the first half of UW’s next game against No. 19 Colorado next Saturday. Oregon also had a player, defensive end Drayton Carlberg, ejected for a targeting hit on UW’s Jake Browning in the first half. Sophomore wide receiver Jordan Chin, injured during fall camp, made his 2018 debut in the fourth quarter. He did not have any catches or any targets. Defensive back Kyler Gordon became the fifth true freshman to play for the Huskies this season. Gordon was on the field for UW’s kickoff teams. He’s the first, and only, to appear in an FBS game. Four other true freshmen played against North Dakota last month: Tuli Letuligasenoa, Jackson Sirmon, MJ Tafisi and Zion Tupuola-Fetui.